Help, I’m a waxing virgin! What do I need to know? First of all, our advice would be to relax and not panic! You’ll be in safe hands with us. We recommend that you take certain steps at home before your wax in order to prepare the area – see the next question for more details. You’ll need to arrive 5 – 10 minutes early for your first appointment, so you can fill out a consultation card, which your therapist may discuss with you in the privacy of your treatment room. Your therapist will then explain the details of the treatment you have chosen and tell you what to do next, e.g. to what extent you should undress. She will leave the room for two minutes so that you can make yourself comfortable on the treatment couch before returning to work her magic. For a more detailed account of what will happen, especially if you’re booked in for an intimate wax, click here. You should try and exfoliate and moisturise your skin in the area to be waxed for a couple of days before your appointment, which will help you get the best results from your wax. If you don’t regularly exfoliate the area to be waxed, you’re likely to have a lot of dead skin there which will be trapping hairs underneath it. By exfoliating and removing the dead skin, you’ll be releasing those hairs, which we can then wax (we obviously can’t remove any hairs that are still below the surface of the skin). Otherwise, you’re likely to see some regrowth quite quickly after your appointment. It’s really important to moisturise regularly too, to keep the skin supple. For the same reasons as above, we want to avoid dry, flaky skin in the area to be waxed. If you’re having an intimate wax, then consider which products you’re going to use to exfoliate and moisturise the area beforehand! You need a gentle exfoliator, preferably unperfumed, that’s not going to scratch the skin or irritate the area. Likewise with moisturiser – choose an unfragranced gentle one, which is not going to irritate or sting! Please do have a shower on the day of your wax to ensure that you’re clean and fresh when we see you. Don’t heavily apply any cream to the area to be waxed on the day of your appointment though. Absolutely not. Every new client at nkd will have a pre-wax consultation, during which we’ll ask about your skin type and other relevant medical details, which we’ll then make a note of on your file so we can be sure to use the most appropriate products for you. For all body waxing and most facial waxing, we use Perron Rigot’s Cirépil Cristal Ocean strip wax, which is a rosin-free, non-fragranced, hypo-allergenic formula, especially developed for sensitive skins. For smaller and more sensitive areas, including bikini and underarms, we use Perron Rigot’s revolutionary Cirépil Euroblonde non-strip wax. Both of these waxes are extremely kind to the skin, even in the most sensitive areas of the body. How long should my hair be for my first wax? The high quality of the wax we use means that we can reach the shorter, finer hairs better than most other waxes. However, we still recommend a minimum of 4 weeks’ regrowth to get the best results. If you have removed the hair via waxing/shaving/plucking or any other way any less than 4 weeks ago, then please bear in mind that although we may still be able to carry out your wax, you are likely to get some regrowth quite soon after your treatment. We advise that you do not book an appointment if you removed your hair less than 3 weeks ago. Worried that your hair (especially your pubic hair) may be too long for a wax? Well don’t! If it needs trimming down, we will do this for you as part of your treatment, so please don’t attempt this at home! Why do I have to pay in advance at the time of booking? nkd is a small, independent business, trying to compete on a tough high-street. Because of our city centre locations, we have very high overheads, which we need to cover if we are to survive. Unfortunately, in the past, we’ve had problems with a lot of clients (new and existing) who either fail to show up altogether or who cancel or change their appointments at extremely short notice. This was a real problem for us as we simply can’t afford to pay our therapists to stand around doing nothing! It’s also unfair on other clients, who would have happily booked in and paid for that slot if it had been free. For these reasons, we now charge in full for the treatment, at the time of booking. We are unable to hold or reserve any slots in our treatment diary without advance payment. If you do not wish to pay in advance for your treatment, we will always accommodate walk-in appointments where we can. Walk-in appointments cannot be pre-booked and as such do not require advance payment – see the next question for more details of these. Please note that any advance payment is fully refundable if you wish to cancel or change your appointment, as long as you give us a minimum of 24 hours’ notice. If you need to cancel or change your appointment within 24 hours of your scheduled appointment time, then we’re sorry but no refunds will be issued, unless we manage to fill your slot with another client. We really appreciate your cooperation here and ask for your understanding on these matters. Do I need to book an appointment in advance, or can I just walk in? Walk-in appointments are ideal for those customers who do not wish to pay in advance, at the time of booking. Walk-in appointments are not pre-bookable so you take your chances on the day! With this in mind, it’s worth noting that while we will always try and accommodate walk-in appointments, sometimes we’re so busy that we can’t. If you have a specific time slot or therapist in mind, or are looking for a long treatment (e.g. one that lasts for more than 10 or 20 minutes), we strongly recommend that you book in advance so as to avoid disappointment. That said, if you want a short appointment – such as an eyebrow wax or thread – then we’ll often be able to fit you in if you pop by. We do sometimes have other, longer slots, available at short notice on certain days, so it’s worth checking if you are in the area and passing anyway. What's the best way to book an appointment? You can ring 0115 924 1454 for Nottingham or 0116 430 0444 for Leicester and speak to one of our friendly receptionists when we’re open, or leave a message if we’re closed, and we’ll call you straight back the next morning. You can email us on either nottingham@nkdwaxing.com or or leicester@nkdwaxing.com, with details of which treatment you’d like and when, and we’ll reply ASAP. Once you’ve been for your first wax, we’d always recommend that you book your next appointment before you leave the salon, so you can be sure of securing your next slot at your preferred day and time. This way, you will secure 10% off your next booking as well AND will automatically entered into our prize draw to win that treatment back, so you won’t have to pay anything at all for it! Please note that for now, we are closed in Leicester on a Monday. During busy times, we may open earlier. E.g. from 9am between Monday –Thursday and from 8am on a Friday and Saturday. If you would specifically like one of these early appointments, then please ask and we’ll see what we can do (advance notice is required). We also offer breakfast waxes on certain days. These super-early morning/pre-work appointments mean that you don’t have to work a full day inbetween showering and getting nkd – and we’ll buy you breakfast at the end of it (really!). Three breakfast wax appointment slots are available: 7.30am, 8am and 8.30am. Please note that for all breakfast wax appointments, a minimum spend of £25 is in place and none of our usual discounts (e.g. 10% maintenance or student/corporate discount can be used. We also require advance notice of around a week for breakfast waxes. Whereabouts do I find nkd? 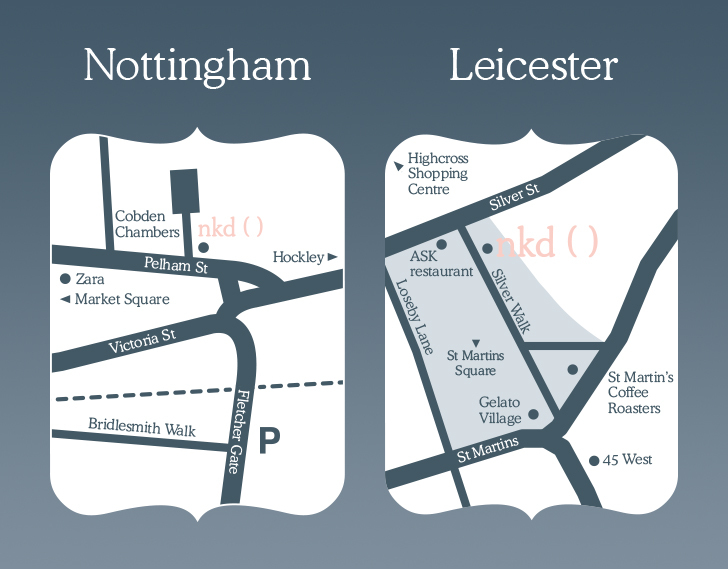 nkd Nottingham is located in the city centre at 27 Pelham Street. Pelham Street is the hill that runs up to Hockley, from the city centre. So if you’re walking from the Market Square, you walk up the hill, keeping Zara to your right. You will pass Space NK, Sweaty Betty and Homemade café on your right hand side, and Thurland Street on your left. We’re further up the hill on the left, before you reach Hockley. We’re opposite Wired Café and Bodycraft Tattoo Parlour and next to Michael Levin, the jewellers. Meanwhile, nkd Leicester can be found in the gorgeous little enclave of St Martin’s Square, which is in the Cathedral Quarter/just by The Lanes. We’re a 2-minute walk from both Highcross and Leicester Market and we’re next door to Flappers and Gentleman hairdressers. What's your cancellation and appointment change policy? The more notice you can give usplease to cancel or change an appointment the better, but we require a minimum of 24 hours’ notice. If you cancel or rearrange your slot with less than 24 hours’ notice, or if you fail to turn up at all, we will retain the payment you made for that appointment. In the event that we manage to fill your late-cancelled or late-changed appointment slot with another client, we will be happy to issue you with a refund on that occasion, or transfer your payment to another appointment if you wish to rebook. This outcome cannot be guaranteed, however, for obvious reasons. I'm running late for my wax, what should I do? You need to call relevant salon (either Leicester or Nottingham) to keep us informed of your movements. If we can move your appointment time back, we will do, but if we have another client booked in immediately after you and no other therapists are free, we’ll be unable to do this. Depending on the time of arrival, late arrivals may be offered a reduced treatment or turned away altogether, but you would still be charged in full for the original appointment booked. Why do I need to arrive 5 - 10 minutes before my first wax? If you’re a first-time client, you should arrive 10 minutes before your appointment time to fill out a consultation card. This will involve you giving us your main contact details and any basic medical details we need to know about (e.g. whether you have sensitive skin or any known allergies, eczema, have used acne creams on the area, are pregnant, etc). Your therapist may speak to you about the information you have given us on this card in in the privacy of your treatment room before your treatment starts. Is there somewhere I can freshen up before my wax? We have a customer toilet that you’re welcome to use! If you know that you’ll definitely be doing this, please arrive a few minutes early, so that your wax can start on time. For all bikini and intimate waxing treatments, we will leave some tea Tree Oil paraben and fragrance-free personal wipes on the treatment couch for you. These gentle, all-over wipes containing naturally-antiseptic Tea Tree Oil, are suitable for all body parts, even the most intimate and sensitive of areas. We suggest that you use these to freshen up at the point that your therapist leaves the room for you to get undressed ahead of your treatment. nkd uses the best and most advanced depilatory wax available in the world right now, which is a brand called Perron Rigot, from France. Perron Rigot has almost 40 years’ expertise in depilatory waxing products and more than 20 patents to its name. In fact, nkd is extremely proud to be the flagship salon Group for Perron Rigot in the UK. We work very closely with them and even run wax training courses on their behalf to teach other beauty therapists and salon owners from across the UK how to wax like we do! You may have come across other, so-called luxury waxes in the past, which are all different colours and ‘flavours’ including chocolate and hazelnut. We just don’t get that! Quite frankly, we don’t care what the wax tastes like – and we suspect you don’t either – as long as it’s kind to the skin and does an excellent job at pulling the hairs out. For all body waxing, we therefore use Perron Rigot’s Cristal Ocean wax, which is a rosin-free, non-fragranced, hypo-allergenic formula, especially developed for sensitive skins. We remove this type of wax with paper strips. For smaller and more sensitive areas, including bikini, intimate and underarms, we use Perron Rigot’s revolutionary Euroblonde non-strip wax, which was the first-ever new-generation disposable peelable wax, which has since been imitated by so many others. Non-strip wax means that we peel the wax directly off the skin (without the use of paper strips), and is the only type of wax you should consider letting near to your bikini line! We’re not going to lie – of course if you pull the hair out from its root it may hurt a little, and more so in some areas than others. But we’re absolutely confident that our specialist skills mean that your nkd wax will hurt less than waxes from other, generalist beauty salons, where waxing is just a small part of their treatment menu, alongside many other treatments. If you don’t believe us, check out our latest reviews, which are proof positive that many clients actually look forward to their next nkd wax! Don’t forget also that nkd’s waxing expertise is such that we teach other therapists and salons from across the UK the latest advanced waxing techniques. And technique really is king– a poor waxing technique will lead to snapped, ingrown hairs and more discomfort for you. Finally, you’d expect us to say this, but waxing regrowth hurts so much less than waxing full growth, so the first wax will be the worst, and the more frequently you return ( we recommend every 4 – 6 weeks) the less it will hurt (and that’s a fact). How long will my wax take? Of course it depends what exactly you’re having done and the extent of your hair coverage, but we guarantee that you’ll be amazed by the efficiency with which nkd therapists work. As a general guideline for regular clients, we’d allow 10 minutes for your average basic bikini wax or brow wax, 20 minutes for a half leg wax, 30 minutes for a full leg wax and 20 – 30 minutes for a Brazilian or Hollywood wax. First-time clients who are not regularly waxed may need to allow a little longer, and you also need to account for the time it takes you to get dressed and undressed and pay/book your next appointment. We should also point out that quick is not always good! Some waxing salons boast of being able to carry out a Brazilian/Hollywood wax in 10 -15 minutes. This is entirely possible, but they will be doing it using strip wax (as opposed to the far more superior non-strip wax that nkd uses for all intimate waxes) and their strips will be very large. The larger the strip = more hair pulled out in one go = more pain! At nkd, we deliberately apply the wax in smaller strips, because although it takes a little longer this way, it is far more bearable for you! How often will I need a wax? We recommend that you get into a 4 – 6 week waxing cycle in order to get the best results from your wax. If you keep it regular, your hairs will start growing through at the same time, which means that your skin will soon remain smoother and hair-free for longer in between appointments. Sporadic waxing, on the other hand, means that your hair won’t be in the same growth cycle, so you’re likely to get some regrowth soon after your appointment from hairs that had not broken through the skin at the time of your last wax, or hairs that were far too short to wax. To encourage you to come back regularly, we’ll give you 10% off your next treatment if you rebook on the day for 6 weeks’ time or less. This is a win-win for everyone – you’ll get better results and will pay less for your wax (and it will hurt less! ), and it’s easier and quicker for us to wax regrowth than full growth. For best results, please don’t shave, tweeze or use hair removal creams between appointments. Should I do anything at home in-between my appointments? Absolutely, YES. Following the correct at-home aftercare procedures are absolutely vital in making sure that you get the best results, for as long as possible, from your treatment. After all, what’s the point in spending all that time and money finding a reputable salon and the best waxing therapist who can give you the perfect wax, if you are not going to look after the area as well yourself so as to prolong the results? Moisturise the waxed area daily (ingrown hairs are often caused by dry or flaky skin which does not allow the hairs to grow through). It is imperative that you use a suitable moisturiser, however, especially for your intimate bits! For this purpose, we especially love products containing natural antiseptic properties such as tea tree oil. Exfoliate the waxed area several times a week to get rid of dead skin cells. Again, think carefully about which products you use here. We do not recommend delving into the back of your bathroom cabinet for that manky old seasalt scrub that you used a couple of times three years ago! Anything too grainy could scratch or irritate the skin and we advise against anything that is heavily fragranced. As well as an exfoliator, consider an exfoliating cloth, which can do a wonderful job at removing dead skin and can leave you feeling beautifully soft and smooth. If going for one of these though, make sure you buy one that you can regularly put in the wash so that it doesn’t harbour germs. Are there any products I can use to stop or reduce hair growth? We do sell a hair growth inhibitor (also called a hair retardant) which can be an extremely effective way of significantly reducing the amount of regrowth in a specific area. Thalgo’s Biodepyl 3.1 is a topical solution which contains the active ingredient Capislow. Capislow has been proven to result in regrowth up to 2 times slower, resulting in a reduction of up to 55% in body hair. It has also been proven to result in fewer and sparcer hairs per cm2, while the hairs that do grow back are finer and softer. Biodepyl 3.1 is available in both concentrate and gel formulas, depending on which body area you plan to use it on. Please note that the use of this product will not permanently stop all hair in growing back in the area you use it on, but instead will notably discourage growth when used in conjunction with waxing. Please ask your therapist for more details. Will I need to remove my underwear? It will depend on what treatment you’re having. E.g. if you’re having a brow wax, then no! On a serious note, then of course you would only remove your underwear for certain intimate waxing treatments. You keep your knickers on for basic bikini and G-string bikini waxes, for which reason we recommend that you wear an appropriate pair which you don’t mind coming into contact with wax and oil. You will need to remove your knickers for Brazilian and Hollywood waxes. Do you supply paper pants? We don’t supply paper pants, no. We’re not shy when it comes to carrying out bikini waxes, and neither should you be! Paper pants simply impede our therapists from doing their job properly. They slow the therapists down and can prevent them from removing all hair. So please don’t be embarrassed when we ask you to remove your knickers, as we certainly won’t be. I'm having a Brazilian / Hollywood wax. What will that involve? Firstly, your therapist will check what treatment you’re having. Then she will leave the room for you to undress your bottom half, including your underwear, and freshen up using the Tea Tree Oil hygiene wipes she’ll leave out for you. Your therapist will start removing the hair on top of your pubic bone first, before moving down to your labia, and finally around the back. At times, she will help you position your legs in certain ways so that she can get to all of the hair, and will ask you to stretch certain bits of skin to keep it taut while she waxes. When it comes to removing the hair from around the back, our preference at nkd is to keep you on your back while we do this. We don’t like turning our clients over and getting them on to all fours, and will avoid this positioning whenever we can. Instead, we’ll ask you first to pull your legs up into a backward roll type position and keep them hugged into your chest. If we really can’t get to all of the hair that way, if you don’t feel comfortable in this position or can’t get into it, or if you’re pregnant and don’t want to lie on your back for too long, then we may turn you onto your side, or over completely, to reach the hair around the back. As with all waxes, once we’ve finished, we’ll tweeze out any remaining hairs before asking you to check the area to see that you’re completely happy with it. Which products can I use on my intimate areas? This is a great question, and one which you should pay close attention to, as using the wrong products on your intimate areas could lead to significant discomfort and irritation. nkd sells a handpicked range of the best and most effective products that are specially formulated to be used on delicate and sensitive areas. These include exfoliators, moisturisers, shower washes and gels, all of which will help look after, soothe and calm the area you get waxed, as well as helping to prevent ingrown hairs. We also sell more specific products, such as specialist ingrown hair solutions for problem areas, and anti-regrowth solutions to help reduce the amount of hair that grows back. We recommend that you talk to your therapist about these products when you come in for your appointment. We’d also strongly advise against picking out any old scrub/cream from the back of your bathroom cabinet to use before and after your wax. The fact is that the vast majority of exfoliators and moisturisers shouldn’t be used on intimate areas, and doing so could sting in the short term and lead to longer-term irritation and skin upsets which are then hard to clear up. What happens if my period comes just before my appointment? As long as you’re wearing a tampon and you’re clean and fresh down there, this won’t be a problem. It’s definitely not an issue for us, but if you’re still not comfortable with getting a wax while you’ve got your period, then please be sure to book your future appointments around your monthly cycle, as our 24-hour cancellation policy does also apply to menstruating women! Will my skin be sore afterwards? It shouldn’t be no, but it is quite normal for a heat reaction to be seen on the skin for several hours following treatment. This may vary from a mild redness to a stronger skin reaction, including red dots on the waxed area for several hours. If nkd’s aftercare advice is followed the skin should return to normal within 24 hours. As we mention above, the superior waxes that nkd uses are extremely kind to the skin, and won’t irritate it like cheaper, mass-market waxes you may have come into contact with in the past might have done. We also take other steps at nkd to help minimise any soreness. For example, before applying any wax to your skin, we will always cleanse and sanitise the area first, before applying Jasmine Oil to prep the area and which helps make sure that the wax encapsulates the hair as opposed to sticking to the skin. This means that when we remove the wax, it won’t pull at your skin as much as other waxes do. Once we have removed all of the hair, we will then apply some moisturising milk and refreshing gel to help soothe and calm the area. You prevent ingrown hairs by following our aftercare advice. Scrub and rub is nkd’s basic recommendation, which in other words means to exfoliate regularly and apply plenty of moisturiser. Ingrown hairs usually occur when the hairs are prevented from growing through thick, dry skin and so they get trapped under the surface. By exfoliating regularly to remove any dead skin, and moisturising daily in order to keep the skin supple, ingrown hairs won’t be a problem for most clients. Note that ingrown hairs are often caused by poor therapist technique, whereby the hair is snapped off instead of being pulling out from the root, which could be one reason why you’ve suffered from them in the past. Some clients, however, do still suffer from ingrown hairs even when they follow our aftercare advice. In this instance, we sell a range of highly-effective specialist ingrown hair solutions which will sort the problem out in no time. These ingrown hair solutions are also great for men who suffer from nasty shaving rashes/bumps around their beardlines. For more detailed advice about the prevention of ingrown hairs, see the aftercare section. Can I have a wax if I'm pregnant? Absolutely, and indeed we see an awful lot of pregnant women at nkd, including very heavily pregnant women who come in for a final tidy-up before the chaos begins! You should bear in mind, however, that throughout pregnancy, your skin may be more sensitive than usual and your wax may feel more uncomfortable than it otherwise would. We will of course adapt our positioning accordingly in order to keep you in comfortable, safe positions while ensuring that we can still remove all of the necessary hair. Why should I choose nkd ( ) for my wax over other salons? Because put quite simply, we are without doubt, the best waxers in Nottingham and Leicester and among the best in the whole of the UK. We regularly welcome clients who have travelled from London and other cities back to the Midlands for their nkd wax. We carry out tens of thousands of waxes each year and our highly-skilled therapists are true experts in their field. We’re so good at what we do that we even teach others how to do it. We regularly run advanced wax training courses from the training school within our Nottingham salon, and from the London HQ of our wax supplier, Perron Rigot. Every year, we carry out a live waxing demo at the UK’s largest beauty trade show in London as well, such is our expertise and experience. We have extremely high professional standards and place a huge amount of emphasis on internal staff training to ensure that no therapist ever slips into bad habits behind the privacy of her treatment room doors. We send out regular post-treatment surveys to all active clients, which is tantamount to continuously mystery shopping ourselves. We read each and every response we receive and we take action where necessary. To date we’re thrilled to have received in excess of 7,500 survey responses, the vast majority of which are overwhelmingly positive. Do you do student discount? How else can I save money at nkd? Why should I get waxed? You should get waxed because you want to! This is usually because you like the look and feel of smooth, hair-free skin. You shouldn’t get waxed, on the other hand, because someone else wants or tells you too! We’re not going to tell you that having a wax is cleaner, or more hygienic, or give you a list of any other reasons why you should have one. Plenty of people choose not to wax or remove their body or facial hair in any other way, and that’s fine with us. We’re busy enough at nkd with clients who want to get a wax for themselves, so we’re not in the business of trying to persuade or convert anyone to remove their hair if they don’t want to. Of course, if you do want to remove your facial and/or body hair, then we think that waxing is the best way to do it. The results of waxing last far longer than shaving, and result in finer, weaker regrowth as opposed to strong, stubbly shaving regrowth. Waxing is cheaper than IPL and Laser and the results are clearer. By this, we mean that once the hair has been waxed, you know for certain that it’s not going to grow back for 4 – 6 weeks, as opposed to so-called permanent hair removal methods, which you can pay the earth for only to find that within a few years, the hair has come back. Do you have any age restrictions in place? Minors under the age of 16 will only be able to have a treatment once we have received written approval of this from a parent or legal guardian. The parent or legal guardian must accompany the minor to the salon on their first visit. On subsequent visits, we’re able to treat the minor without a parent or legal guardian present, as long as the parent or guardian has previously signed to say they agree to this. Please note that it is nkd’s policy not to carry out any male or female intimate wax (e.g. a Brazilian or Hollywood) to any minors under the age of 16, even with parental permission. A basic bikini wax or G-string bikini wax (or speedo wax for male clients) will be offered as an alternative. 16 year-olds and over do not need parental permission for any treatments. No upper age restrictions are in place! nkd reserves the right to refuse to carry out a treatment on a client for age reasons, even when parental permission has been given.